Now that I’ve had a little bit of time to sit down and digest the hectic season of work mixed with holidays mixed with weather, here’s a more thorough look at last week’s epic Northeast blizzard. With the snow expected to hit hard, the Herald had a bunch of us working last Sunday hit up various angles to find snow features. Knowing about my skiing background, the folks at the Herald kept me out of the city and looking for features at local ski areas. It was obvious that ski areas were salivating over the idea of 2 feet of fresh snow during winter vacation week, so I had a great opportunity to hit up my old stomping grounds at Ski Ward in Shrewsbury, Mass., where I spent two seasons as a ski instructor in high school. Shrewsbury, Mass. -- Suzanna Rachimi, 13, of Ashland, dives into the tubing chute at Ski Ward in Shrewsbury, Mass., on Dec. 26, 2010. Shrewsbury, Mass. -- Ryan Miller, 17, of Westboro, jumps off a pipe in the terrain park at Ski Ward in Shrewsbury, Mass., on Dec. 26, 2010. Boston, Mass. -- Paul Peterson, a facilities employee for Tufts University, clears out snow along the Harrison Avenue sidewalks on Dec. 26, 2010. Boston, Mass. 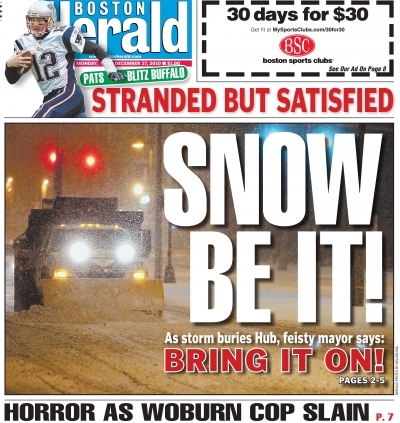 -- A snow plow truck makes its way onto Harrison Avenue from Herald Street on Dec. 26, 2010. And of course, when I made it back to the office, our security guard wouldn’t let me in the building until I shook off the snow I had acquired on my stroll. I was a little disappointed there wasn’t more. Oh well. I rang in 2011 the same way I rang in 2010, spending New Year’s morning in South Boston with the L Street Brownies as they jumped into Dorchester Bay for their annual Polar Bear swim. Granted, it was a little balmier this year with temperatures hovering near the 60-degree mark for most of the day, but that didn’t mean the water was warm. This year, I brought some waders so I could get a little deeper into the water. Didn’t mean I stayed dry though! The 2011 Brownie Jump was just as fun as last year’s, and the people who do it are always a lot of fun to hang out with. And since the 2010 Brownie Jump was the first assignment of a very fruitful year for me, here’s hoping 2011 is even better! Boston, Mass. 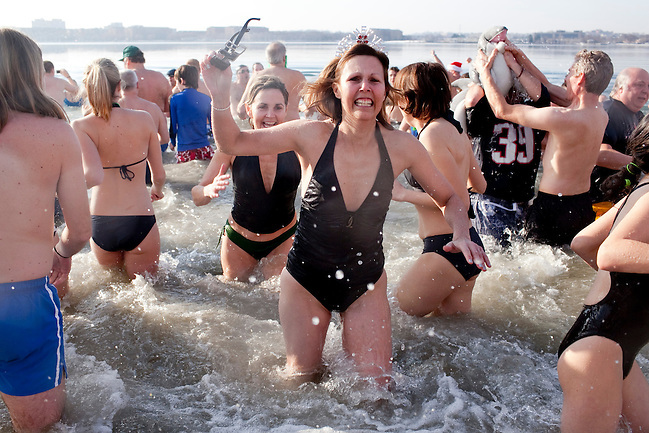 -- A woman rings in 2011 with a dip in Dorchester Bay at the L Street Brownie swim on Jan. 1, 2011. The 2011 swim brought the largest crowd ever, with more than 700 swimmers and about 2,000 spectators, L Street Brownies president Jack Dever said. He attributed the larger crowd to the weather, with the air temperature at 54 degrees at the time of the 10 a.m. swim. The water, however, remained a frigid 34 degrees. Boston, Mass. -- L Street Brownies president Jack Dever pumps up the crowd at the L Street Brownie swim on Jan. 1, 2011. The 2011 swim brought the largest crowd ever, with more than 700 swimmers and about 2,000 spectators, Dever said. He attributed the larger crowd to the weather, with the air temperature at 54 degrees at the time of the 10 a.m. swim. The water, however, remained a frigid 34 degrees. Boston, Mass. -- Stephen McKenna, running in costume for the L Street Tavern charity, leads the charge into Dorchester Bay at the L Street Brownie swim on Jan. 1, 2011. The 2011 swim brought the largest crowd ever, with more than 700 swimmers and about 2,000 spectators, L Street Brownies president Jack Dever said. He attributed the larger crowd to the weather, with the air temperature at 54 degrees at the time of the 10 a.m. swim. The water, however, remained a frigid 34 degrees. Boston, Mass. -- Meagan Johnson, 16, of Andover reacts to the cold water in Dorchester Bay as her grandfather, Tom Furey, and her sister and cousin, Kelly Johnson, 14, and Leah Hart, left, follow her out of Dorchester Bay at the L Street Brownie swim on Jan. 1, 2011. The 2011 swim brought the largest crowd ever, with more than 700 swimmers and about 2,000 spectators, L Street Brownies president Jack Dever said. He attributed the larger crowd to the weather, with the air temperature at 54 degrees at the time of the 10 a.m. swim. The water, however, remained a frigid 34 degrees.